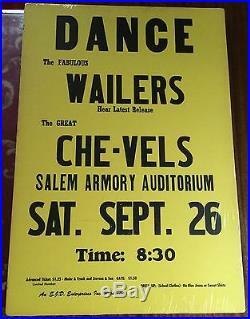 14″ x 22″ ORIGINAL Boxing Style Concert Poster for a show on Saturday, September 26th 1964 at the Salem Armory Auditorium in Salem, Oregon featuring The Fabulous Wailers and the great Che-Vels. There are reproductions of posters like this out there, but this one is stone cold original and in just about PERFECT CONDITION. Obtained years ago from the original promoter of the concert, Edward Mr. EJD Dougherty, Oregon’s foremost Rock Concert Promoter. These posters were meant to be hung on telephone poles and store windows and then mostly destroyed after the shows were over. The item “The Fabulous Wailers ORIGINAL 1964 Boxing Style Concert Poster” is in sale since Saturday, January 03, 2015. This item is in the category “Entertainment Memorabilia\Music Memorabilia\Rock & Pop\Artists W\Other Rock & Pop Artists W”. The seller is “johntefteller” and is located in Grants Pass, Oregon. This item can be shipped worldwide.